The TOEFL test is designed to measure the English skills of non-English speaking people by testing their writing, reading, listening and speaking abilities. This may sound terrifying at first, but that’s okay. It’s natural to feel a bit nervous or overwhelmed (feel like you have too much to do). But I have even more good news for you: It’s a really useful test. As a language teacher, I love that the TOEFL test is all about using real English in a real-life setting. It’s not about complex grammar and difficult vocabulary that you would never use in real life. So when you study for the TOEFL test, you’re also preparing yourself for using English in real life—like at a university or job. Okay, okay. But you still need to pass the test with a good score to reach your dreams. I know. 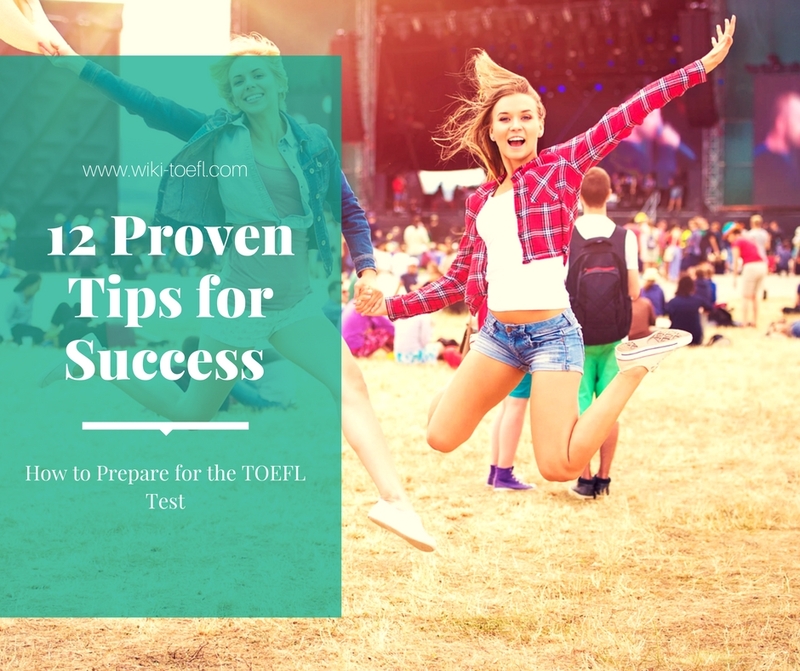 With the following proven strategies, you’ll be able to successfully prepare for your TOEFL test, take it with confidence and pass it like a professional. If you want to take the TOEFL, it is very important to first get familiar with the TOEFL format. Decide which format you want to take. Note that nowadays the test is usually taken via the Internet. The paper-based test is becoming less and less popular. Take a look at some examples of some TOEFL test questions. This will help you gain further understanding of the types of questions to expect. Read the questions carefully. Try to answer them and then check the answers. Different goals require different minimum scores. First, be sure you know the minimum score you’ll need to reach your goal. Then, choose what score you’d like to get. This is your ideal (preferred) score. For example, if I want to get into Arizona State University, the minimum score is 500. My ideal score might be higher, though: 530. Find your top three ideal study locations. It may be your room, the library, a cafe, your office, your living room or anywhere else. But it’s important that you feel comfortable in the spaces. Why three? If you feel unmotivated in your room one day, then you can always more to the library or your favorite coffee place, for example. Keep your study space clean and organized. Clear off your desk and organize your files. Use a system that works for you. Make sure that your pencils are sharpened and your pens are working. Maybe you could get a new, clean notebook just for the TOEFL test. Schedule your breaks, snack and mealtimes. By scheduling your breaks, you will be able to focus better during study time. Scheduling when to eat will ensure you don’t forget! And eating healthy food will help you concentrate better. Keep a bottle of water near you when you study so that you drink enough water. Clear your mind. Exercise and do some meditationor relaxation exercises for a positive mindset. The apps Calm and Headspace are excellent for meditation. Taking three slow, deep breaths can also be very beneficial. You can try the 4-7-8 relaxing breathing exercise as well. Count to 4 while breathing in slowing. Then hold your breath for 7 counts. Then exhale slowly counting to 8. Repeat this 3 or 4 times. If you feel frustrated or unable to concentrate during a section, take a few breaths again to calm down. Relax. Get focused. Here’s an official study guide that can be helpful. Read the explanation of the test and study tips carefully. Get familiar with each section before starting with any exercise or practice test. When starting, you can take a practice test just to give you an idea of your current abilities. To get feedback on your performance—from a professional TOEFL grader—you can use a resource like ScoreNexus. With ScoreNexus, you can take a full TOEFL exam and receive a grade, feedback and advice for improving your score from a real teacher. This is a great way for you to see where your strengths and weaknesses are. You don’t have to do this alone. You can get support from peers (other students) and teachers. Verbling — Choose from hundreds of online English teachers based on their availability, price range, experience and certifications. You’ll probably be able to find someone here who specializes in teaching English for the TOEFL. Wyzant — Find an ESL teacher in your local area, who will tutor you in person! italki — Find an online teacher for video lessons. Craigslist — You can post an ad for an English tutor, or see if anyone is already offering the service. Buddy School — You can search for English language tutors and schedule Skype lessons with them. On Meetup you can look for language exchange events near you. Through Couchsurfing you can find events, travelers and English speakers in your area. Send them a message and meet up for a coffee. There is nothing better than face-to-face communication. Native speakers will be happy to practice English with you, if you teach them your native language in exchange. Language exchanges are fun and benefit both. You may even develop life-long friendships as an added bonus. To find native speakers online that will correct your writing for free, use Lang-8. Other language learners will be excited to exchange strategies, to study together and to motivate each other. To study together, pick the same listening or reading material. Ask each other questions and discuss what you’ve listened to or read. Summarize the information and fill in the details together. On Facebook, type in “TOEFL” into the search bar, for example. Scroll down and click “see all results.” On the top right click “more” then click “groups.” You will then see all TOEFL-related groups on Facebook. You can also search for “language exchange,” “English learning,” “EFL,” “ESL learners” and many other keywords. Online communities are great, especially if you live in a small or remote area without in-person opportunities. Communicating online will help your writing abilities. Exchanging ideas within a forum or a chat box gives all parties time to think about their answers and give proper advice. You can set up Skype calls with your online contacts to practice speaking as well. Stop after every few paragraphs and ask yourself some questions. For example, What did you read about?, What was the main idea?, What was the conflict?, Who are the main characters?, etc. Read the story again to check back for answers. In the end of your reading, summarize what you’ve read about. You can do your summary in writing or by speaking to practice for the writing or speaking sections at the same time. Pages 28-31 of this TOEFL test prep planner have many more ideas for specific listening goals. Real people. Use the sources from #6 to find native English speakers. If you don’t understand something, ask them to repeat it. Join in the conversation and ask follow-up questions. Remember, you can set up a Skype call if you don’t have an English-speaking community in your area. Audio for English learners. Listen to academic lectures on UIC, a variety of audio clips on Many Things or ESL-friendly podcasts on A4ESL, for example. Select the level that’s appropriate for you. Then to push yourself a little more, choose a level that is a bit more challenging and one step higher than your current level. It is recommended that you start with the EnglishClass101 podcast series by Innovative Language. The podcasts here come with transcripts and tools to practice your English. Since these podcasts are made for English students in particular, they will be clear and it will be much easier to take notes. Plus, there are podcasts for all skill levels, from beginner to advanced, so you can practice basic English skills or choose to challenge yourself. Audio for native speakers. There is so much content out there, so here are just some ideas to get you started. Watch YouTube clips, FluentU videos, TED Talks, TV shows and movies in English. Listen to the radio, music and the news. Take online courses. Stop your clip or audio every 2-5 minutes and ask yourself some question.What’s the topic? What was the main idea? Who are the characters? What’s your opinion about the topic? etc. Listen again to check your answers. Rewind if you didn’t understand something. Write down any new vocabulary you find, and look up its meaning. Listen to the same audio 2 or 3 times to find new details. At the end of your listening, summarize what you’ve heard. You can summarize it by writing or speaking out loud, to practice for the writing or speaking sections. Use your new words in your summary. Review your grammar. Here are some online review exercises from Purdue OWL. Review your irregular verbs and practice using a variety of verb tenses. Make sure you understand modal verbs and conditionals. Review the difference between gerunds and infinitives. Have a good understanding of prepositions and articles. Finally, practice phrasal verbs in sentences. Ask the help of a teacher or a native speaker to clarify your doubts. Write in English every day. Write a journal, emails, shopping lists, to-do lists, letters and even Facebook posts in English. To get used to writing in English for a period of time set your timer for 15-25 minutes when journaling, writing letters or blog posts. Pay attention to your grammar even if you aren’t working on a specific exam topic. Check for spelling and grammar mistakes. Don’t forget to pay attention to your punctuation. Use Grammarly to check your spelling and grammar. (It’s much better than regular spellcheck.) If possible, ask a friend or a tutor to correct your writing. Talk to your pets or even house plants in English. Speak in front of a mirror. If you have trouble with a particular word, practice it until you get it right. Repeat the same word or phrase in English over and over again until you get comfortable. Check the International Phonetic Alphabet (IPA) for pronunciation guidance. Don’t forget that most online English dictionaries will have a button that says the word aloud, too. Record yourself speaking. Then, listen to the recording for errors. With your friend or tutor, listen to recordings of yourself speaking. Ask them for feedback on your pronunciation, clarity and grammar. Take notes on your common mistakes so you can keep practicing when you’re alone. Set up Skype calls to get used to speaking via a headphone. Bring in specific topics to discuss. I recommend using recent reading or listening materials as your topic. You can even speak to non-English speakers in English. They won’t be able to correct you, but you will still be able to practice speaking out loud. There are two different types of learning: active and passive. Make sure you’re using both strategies in your study plan. Active learning happens when you are making an effort and studying with a goal in mind. For example, when you are taking practice tests, working with a teacher, memorizing your vocabulary, listening closely to a podcast—pausing often or doing grammar exercises, you are actively learning. Tips 7-10 in this post are active learning strategies. Watch movies or TV shows without the pressure of using your dictionary. Pick your favorite film and watch it again. Choose a book that will capture your interest, and again, don’t read with a dictionary. I usually suggest reading novels by Agatha Christie for my ESL students. They are relatively short and easy, but not too easy reads. Since they’re interesting detective stories, you’ll want to finish reading to find out who the murderer is. Speak or correspond online in English without a learning goal in mind. There are so many Facebook groups out there. Choose one that’s about your hobbies—not about ESL. For example, as a runner I would choose a group that is about running or endurance sports. If you are preparing for a test, it is only natural to practice taking the test. Measure your progress. Take the practice tests from your study guide to measure your progress. Go over your mistakes and practice the areas you’re struggling with. After a few weeks, take the same test again. Compare your scores and check for improvements. Create an exam environment. When you take practice tests, pretend you’re in a real exam environment. You’ll want a quiet space and to time your practice test properly. At the exam center, you can’t take your personal belongings with you. So lock your phone, notebooks and other distracting items away. No aids, like notebooks, dictionaries, calculators and so on can be used; put everything away. At the exam center you also won’t be able to eat or drink during the test, so make sure that you drink water and eat something before your practice test. Schedule your bathroom break before taking the practice test as well. There is no minimum or maximum number of practice tests to take. Be determined until you get your minimum score (or even your ideal score) consistently. Don’t give up. Once you’ve done the preparation, go and take that test! Remember your hard work. Relax. Be confident. With consistency and hard work, there is no doubt that you will pass your TOEFL. I believe in you. You should believe in yourself too. Good luck!